Oh, the simple pleasures of June Mountain! June Mountain Ski Resort is what winter dreams are made of, whether you are an adrenaline junkie or trying to get away from the crowds. 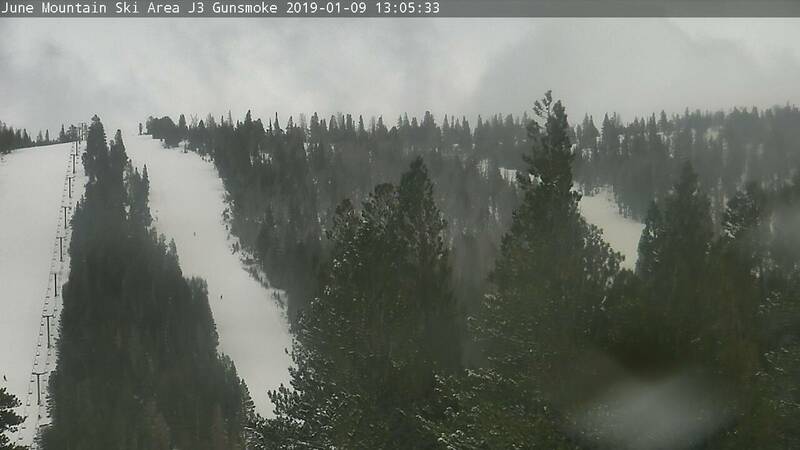 June Mountain Ski Area is located in the pristine Eastern Sierra Mountains between Yosemite just to the north and Mammoth Mountain just 20 minutes south. June Lake is referred by some as the Switzerland of California and the small vacation town and tranquil ski resort make for a perfect stress free, old fashioned mountain getaway. June Mountain has wide ski runs with easy terrain, as well as challenging back country skiing and snow boarding. The quiet runs make it great for beginners, while the natural chutes and terrain beckon those looking for rush and vert. "Gunsmoke, on top of June Mountain, is the best test run slope on planet earth." Tom Sims, Snowboarding Pioneer (1950-2012). The Town of June Lake has a long history of winter sports. The Eastern Sierra it has always gotten large amounts of snow averaging 250” to 300” inches a year. Skiing on June Mountain started in the 1940s with a rope tow set near Oh Ridge for $1 a day. In 1945 Chuck Osborn began Dream Mountain Ski Tows a couple miles west of where June Mountain is today. In 1946 June Lake got electricity, making dreams of a resort more realistic. In 1955 Mammoth Mountain Ski Resort opened just 14 miles south to many excited skiers. It was Bud and Lois Hayward, however, who made the June Mountain dream come true. It took enthusiastic crews nine months to construct the J1 chairlift and chalet which still stands today. Whew! On President’s weekend in 1961 June Mountain opened with a foot of fresh powder. June kept expanding with more lifts and by 1964 there was 15 miles of skiable terrain. In 1986 Dave McCoy, owner of Mammoth Mountain, bought June Mountain and replaced and added more chairlifts. June was a pioneering resort in the west coast snowboarding scene, being one of the first resorts to allow the new sport in the 80s. In 1989 it built one of the first half pipes in snow and hosted one of the first televised snowboarding competitions, the OP Pro. In the summer of 2012 it was announced that June Mountain would be closed for the 2012-13 season. This was devastating for all who have a special place in their heart for June Mountain, but as promised it re-opened for the 2013-14 season. In 2014, Mammoth Mountain announced that it had purchased Big Bear and Snow Summit Resorts. This opens many opportunities for season pass holders to experience different trails and mountains, while stabilizing June Mountain’s future. 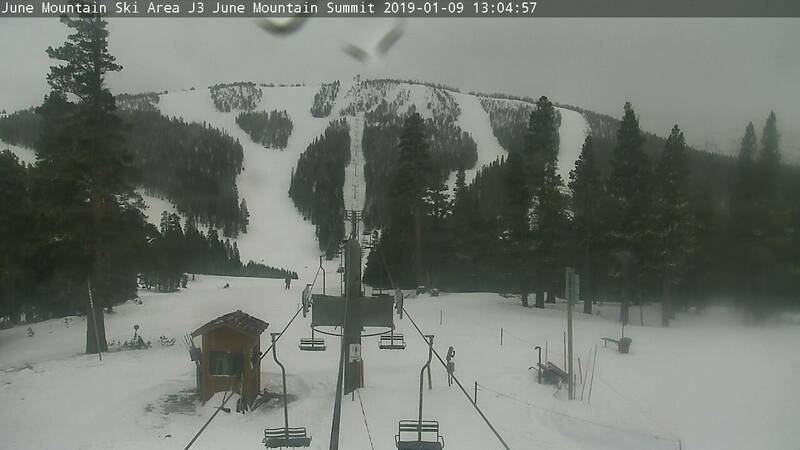 June Mountain ski area, like it always has been, is a family friendly mountain where all types of skiers and riders can relax and take in the true alpine experience. From the lodge, you look down in the June Lake Loop, or Horseshoe Canyon as it was once called. The view alone of the frozen lakes and majestic mountains is enough to take your breath away. Even if you don’t ski, take a ride up the stunning chair lift and have a hot chocolate at the top. June now has 1,500 skiable acres with seven lifts and 35 trails. From the chalet you can access the rest of the lifts. The carpet hill, bunny hill and ski school are directly in front of chalet making it fun for friends or parents to watch beginners learn to ski or board. The resort actually consists of two mountains. There is Rainbow Mountain, which is 10,040 feet and hosts chair 4 and chairs 6. Rainbow Mountain is preferred by beginners and kids. June Mountain itself sits at 10,174 feet and hosts chairs 2, 3, and 7. Chair 7 is steep, fast and perfect on those deep powder days. From the resort you can access some of the best backcountry the Eastern Sierra offers. Dare it alone or have the Sierra Mountain Guides take you places like the Gnome Zone, the Negatives, Devil’s Slide, and Carson Peak. June Mountain Ski Resort does not patrol or avalanche test these back country areas. Sierra Mountain Guides is located at the conference center near the main parking lot. Other amenities the resort offers are a rental shop, repair shop, retail shop, full service bar and eatery. Whether you are grabbing a quick bite between runs or having a drink at the Antler Bar, you will not find a better winter view! The June Meadows Chalet can also be rented for weddings and special events. Why come to June Mountain? Avoid the crowds and push your limits. The views are better, lines are shorter, and a lift ticket cost less than nearby Mammoth Mountain. The best part is kids under 12 ski free, all year long! Also the ‘Cali4nia’ pass is good at June Mountain. With this pass you can ride June Mountain, Mammoth Mountain, Big Bear and Snow Summit Resorts. This means 5,888 of skiable acres, 61 lifts, 240 trails, 15 terrain parks, 6 half pipes, and 2 super pipes. Don’t want to take drive here? Fly to the Mammoth/Yosemite Airport from Los Angeles, San Diego, San Francisco, Las Vegas and even Denver. There has never been a better time to fall in love with June Mountain. Accommodations: Where to Stay in June Lake? 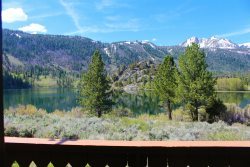 Our small town of June Lake offers plenty of "home town" accommodations including custom vacation homes and vacation condos. 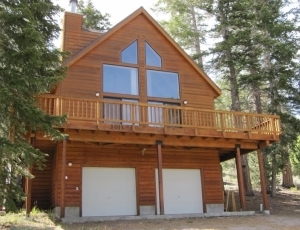 All rentals are very clean and well maintained, very affordable, and all are close to Gull Lake and June Lake. Some are pet friendly vacation rentals. Are you looking for a bountiful weekend of fishing? How about a romantic weekend, or an extended stay with family and friends? Whatever your vacation desires may be, let us help you book a vacation that will keep you coming back for years to come. Call us today, or book online. Call the friendly staff at June Lake Accommodations 760-648-1919 to plan your next June Lake vacation.